Image Courtesy of 100 Black Men of America, Inc.
100 Black Men of American Inc. is a civic organization dedicated to the improvement of quality of life in the African American community through fostering the development of young African American men. In 1963, a group of African American men met in New York to discuss concerns about the cultural and financial obstacles that have limited the achievements of African Americans, particularly young males. Among these founders were David Dinkins, Robert Mangum, Dr. William Hayling, Nathaniel Goldston III, Livingston Wingate, Andrew Hatcher, and Jackie Robinson. These men eventually formed 100 Black Men. They sought to nurture the intellectual development of black youth and enhance the economic empowerment of the African American community based on the following precepts: respect for family, spirituality, justice, and integrity. Their programs include leadership development, youth mentoring, educational scholarships, health and wellness, and economic development. By 2008 the organization had grown to over 105 chapters with more than 10,000 members who continue to strive to improve the quality of life in African American communities and enhance the educational and economic opportunities for African Americans. 100 Black Men of America, Inc. has also more than 100,000 youth participants annually in its mentoring and youth development programs. All members are volunteers and represent various sectors including education, engineering, law, business, health, and politics. 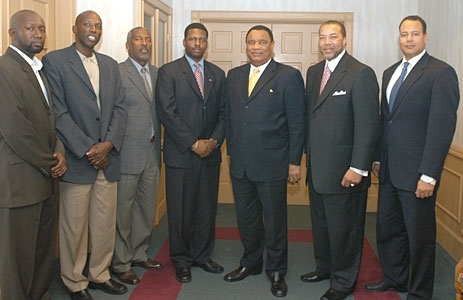 Official website: http://www.100blackmen.org/; Ervin Dyer, “100 Black Men links teens to high tech,” Pittsburgh Post Gazette, August 27, 2001.